Jason Lutz,Oil &amp; Gas Market Manager for Midland Manufacturing. NARs, no matter the amount of product that is accidentally released, can have a wide range of negative effects. The most obvious is the cost of cleaning up a hazardous material spill. Another concern is the safety risk that is created for personnel who are working near the railcar when a NAR may occur. There is also the potential for fines that result from repeated NAR incidents. There is also the incalculable cost that can result from the adverse publicity that may arise in conjunction with a high-profile NAR occurrence. Finally, there is the economic cost to the operator in terms of the amount of money that must be spent to complete a cleanup operation. Since 1996, the AAR has been tracking the number of NARs that occur in North America on a yearly basis through its “North American Non-Accident Release (NAR) Reduction Program.” Since bringing to light the frequency and dangers of NARs, the results of the AAR NAR-reduction program have been nothing short of amazing. In the first year of the program, the AAR, in conjunction with the Bureau of Explosives (BOE), reported 1,241 NAR incidents in the U.S. and Canada. At the conclusion of 2011, the total number of NARs was 632, which was the second-lowest annual total ever and a 49 percent reduction in yearly NARs since the program was initiated 15 years earlier. While shippers of record and equipment manufacturers for the railroad industry can give themselves a well-deserved pat on the back when reviewing these numbers, they must also take great care to remain vigilant and keep NAR prevention a front-of-mind concern. As the popularity of crude-by-rail grows, the financial and environmental risks involved in this type of shipping demand eagle-eyed attention in order to ensure that a rise in NARs is not experienced. Several crucial components have come together to create the perfect storm that is the rapid increase in exploration and production of shale oil. For example, the richness of the unconventional oil reserves in the Bakken Shale in parts of North Dakota, Montana and Saskatchewan, the Canadian Oil Sands and the Eagle Ford Shale in Texas, and other liquids-rich shale deposits in the U.S. and Canada; the rapid rise in horizontal-drilling and hydraulic-fracturing expertise and proficiency; and the postponed approval of the Keystone XL Pipeline, which would cut through the nation’s midsection from Canada to Texas, have prompted producers to seek alternative methods to get crude to their markets. Aiding the rapid increase in rail carloads of crude is the existing rail infrastructure, which is efficiently transporting loads of frac sand, drilling pipe and other equipment needed to establish new production sites. With the available pipeline space quickly becoming unable to adequately meet the transport needs of the growing domestic crude supply, rail, with its vast existing network, is fast becoming the transportation mode of choice for crude-oil producers and shippers. Simply put, rail lines and spurs are more abundant, more convenient to use, easier to access and offer more flexibility to shippers than crude-oil pipelines. 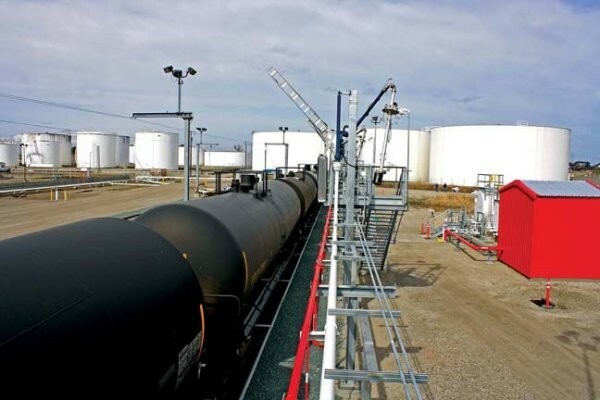 In surveying the changing production and supply landscape, the oil companies are responding with expedited plans to build or expand terminals that can load or transload 95- to 118-car unit trains, which are capable of hauling up to 68,000 barrels of crude-oil products per trip. For those smaller producers who can’t fill a 118-car unit train, or don’t have access to a pipeline or manifest (mixed-commodity) trains, rail companies have begun subleasing smaller unit trains for their crude-by-rail customers. With crude-oil carloads, according to the December 2012 AAR Rail Time Indicators report, standing at 64,663 at the end of September 2012, a nearly four-fold increase from the 16,789 at the conclusion of the third quarter in 2011, numerous terminal projects scheduled to come online in 2013 and major pipeline projects expected to remain stagnant for the foreseeable future, all of the major railroads are extremely confident that the infrastructure they currently have in place will mean that crude-by-rail will continue to transform crude oil logistics. In addition to the ready availability and cost-effectiveness of the rail infrastructure, rail companies have suggested that transporting crude oil by railcar is as safe, if not safer, than transporting it via pipeline. Dedicated crude railcars also mean that the quality of the product that is delivered to the refinery will not be compromised during transport. This is not always the case with crude that is delivered via pipeline, particularly if multiple leaseholders are using the same pipeline. But the bottom line remains that, with the growth in the volume of crude oil that is crisscrossing the continent in tank cars, the railroads must take great care that they do not lose sight of their responsibilities in preventing NARs. Already, the growth of crude-oil shipments was put under the spotlight in the April 2012 NAR report. Through 2011 (again, 2012 NAR data is not yet available), AAR/BOE data showed that the number of crude-oil NARs had increased to 44, up from 24 in 2010. That gave crude oil the third-most NARs per commodity in 2011, slightly behind hydrochloric acid solution (second overall with 51). The leading commodity in NARs for 2011 was Alcohols NOS with 88, which was down from 102 in 2010. While the growth in crude-oil NARs can be written off to the increase in the volume being shipped via railcar, the potentially deleterious effects – which, as mentioned, can include clean-up costs, fines, injury risks and negative publicity – cannot be overlooked. That’s why shippers need to ensure that the railcars that carry their products are up to the crucial task of preventing NARs. Quoting the AAR on its NAR.AAR website, “The vast majority of reported NARs involve small quantities,” meaning crude-by-rail is an excellent and highly flexible takeaway method for crude-oil producers, marketers and refineries. Despite that, the risk involved in shipping crude by rail is increasing as the volume of cars increases and the number of trips per month grows. If valves and fittings, the smallest items on the tank car, but the first to potentially have issues, aren’t the proper equipment or adequately maintained, the chances of a NAR occurring will continue to grow. One incorrectly functioning piece of equipment can harm personnel, the environment and the reputation and wallet of the shipper, so all components must be deemed able to function properly. Crude-by-rail shippers that commit to reducing and eliminating NARs are those that will excel or profit the most from this market growth. Thankfully, basic vigilance and an adherence to accepted equipment installation and maintenance practices are usually all that are required to achieve a reduction in NARs. Taking these concerns into consideration, and knowing full well that any number of regulatory agencies are also keeping a close eye on their exploration, drilling and transportation activities, crude-by-rail shippers are recognizing the NAR risks that are inherent in this type of transport and taking proactive steps to mitigate them. This includes taking a greater interest in the condition of the railcars they lease for their shipping activities. Part of ensuring that NARs won’t occur is also being aware of the condition that the crucial components located on the railcar – the various valves and fittings – are also up to the challenge of safely shipping crude oil, a commodity that looks to continue to grow in volume and importance as the U.S. continues to search for effective ways to decrease its dependence on foreign sources of petroleum products.